Land Destroyer: Turkey's Failed Coup: "A Gift from God" or from Washington? Turkey's Failed Coup: "A Gift from God" or from Washington? July 18, 2016 (Tony Cartalucci - LD) - The coup this weekend that rocked Turkey was a particularly spectacular geopolitical development. Theories abound regarding who was behind it and their motivations for carrying out what ultimately proved an apparently failed attempt at removing the government of President Recep Tayyip Erdogan. Still, it is too early to tell, as facts are far from forthcoming. However, it is possible to discern the most plausible possibilities based on the subsequent actions taken by various potential players who may have been involved in the coup attempt. The most significant of these actions is President Erdogan's own accusations against the United States for having engineered the coup in collaboration with self-exiled Turkish political figure, Fethullah Gulen. Tensions between Turkey and the US have escalated following the attempted coup against the Erdogan administration, with the country's leader demanding the extradition of a US-based cleric accused of orchestrating the violence. Another senior official has directly blamed the United States. Indeed, tensions "rising" might seem like an understatement if Turkey truly believed the US was behind the coup attempt. 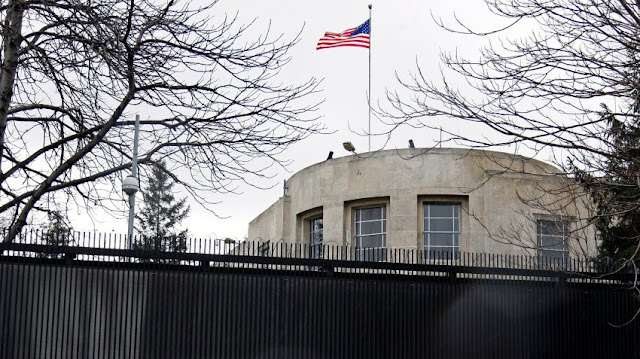 In essence, Turkey is accusing the United States of backing an attempted assassination of Turkey's president, the bombing of the Turkish parliament building, the strafing of Turkish citizens from the air, and the deployment of heavy armor in Turkey's streets. In essence, Turkey has accused the United States of an overt and egregious act of war. However, considering the gravity of Turkey's accusations against the United States, its actions so far have been disproportionately subdued. No one is suggesting that Turkey would "go to war" with the United States, but even amid diplomatic rows of far lesser significance, nations have expelled diplomats and withdrawn the use of their territory for specific uses by the nation in question. Turkey, so far, has done none of this in regards to the United States. In the coming week, should Turkey fail to take even these most basic punitive - even cautionary measures, it would appear Turkey's accusations are a distraction - but a distraction from what? Arrests in Turkey after Friday's failed coup have risen to around 6,000, with President Erdogan vowing to purge state bodies of the "virus" that caused it. At a funeral for one of the victims, Mr Erdogan again blamed US-based Turkish cleric Fethullah Gulen for the plot. Mr Gulen strongly denies any involvement. High-ranking military officers and 2,700 judges are among those held. Beyond Nazi Germany or the Soviet Union under Joseph Stalin, one would be hard pressed to cite a political purge of this scale. Despite the sweeping scale of the mass arrests - the Western media has reported on them without the sensational hysteria that generally accompanies the arrest of even one US-backed opposition member in any other nation. The scale of the arrests are such that preparations for them must have been made ahead of time, calling into question the very nature of the coup itself. 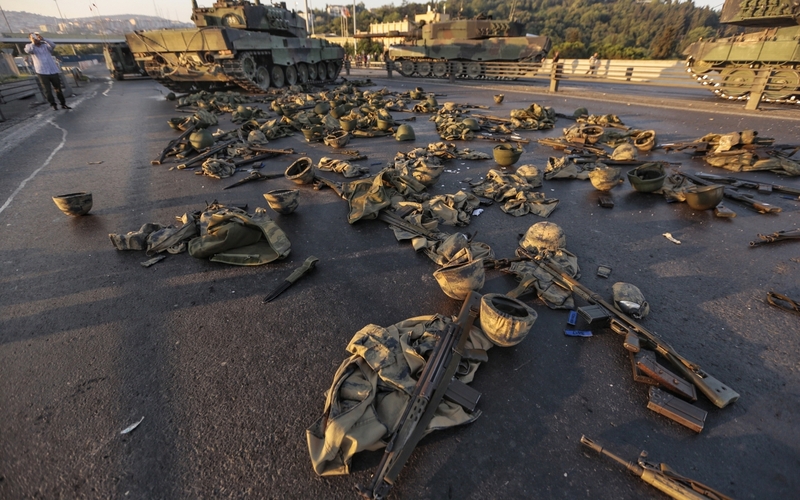 The Coup Was a "Gift From God"
"They will pay a heavy price for this," said Erdogan, launching a purge of the armed forces, which last used force to stage a successful coup more than 30 years ago. "This uprising is a gift from God to us because this will be a reason to cleanse our army." 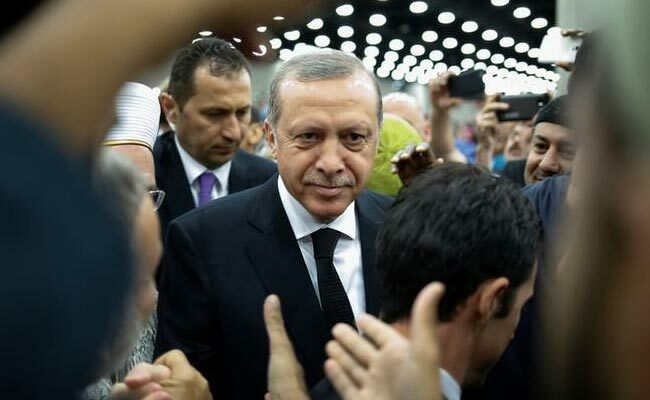 President Erdogan, heading a NATO-member state and a stalwart US ally, receiving a "gift from God" from an alleged political opponent lodging in the United States, raises serious suspicions over the true motivation behind the coup. While it appeared as a convincing attempt to oust President Erdogan from power, it ultimately failed and instead provided him with the perfect context to uproot the military "deep state" both his political allies and US policymakers have sought to eradicate for decades. Despite the apparent "rift" between the United States and Turkey's president, it should be noted that for the past 5 years particularly, President Erdogan and his government have played a key role in US-led regime change operations in neighboring Syria. It was President Erdogan's anti-secular factions, including factions within Turkish intelligence and within the military itself, that trained, armed, equipped, and provided cover for terrorists operating within, along, and over the Turkish-Syrian border. 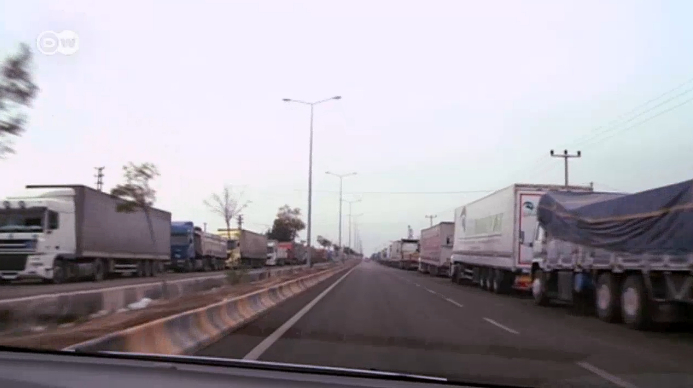 Image: A torrent of supplies cross the Turkish border into Syria destined for Al Qaeda and the self-proclaimed "Islamic State." The US and Turkey have done little to expose this, saying nothing of their inaction to stop it. It was only Russian airstrikes along the border that have finally brought the torrent down to a trickle. Without President Erdogan's stalwart support, US designs in Syria would have been untenable even before they began. While the US poses as "fighting" terrorist organizations in Syria, it has consistently neglected any attempt to secure the Turkish-Syrian border over which the summation of material support for these terrorist organizations is passing. It must be remembered that not only are the US and Turkey cooperating in regards to Syria, the US has troops stationed within Turkey itself, engaged in various aspects of the ongoing violence in Syria. US intelligence agencies have admittedly operated along the Turkish-Syrian border since as early as the beginning of 2012, according to the New York Times article, "Arms Airlift to Syria Rebels Expands, With C.I.A. Aid,"
If the world is expected to believe accusations by Turkey regarding US involvement in the recent coup attempt, Turkey must materialize significant changes in its foreign policy. 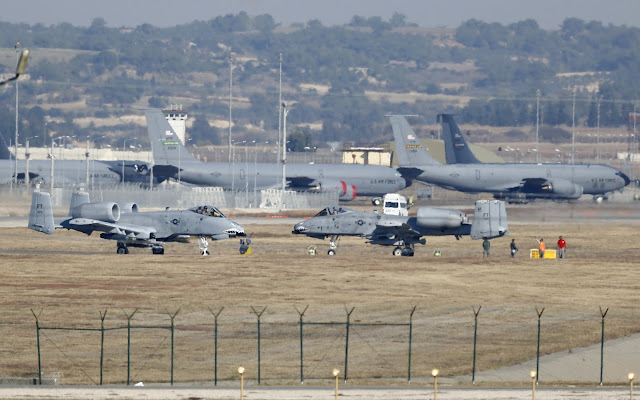 This would include the expulsion of US forces from Turkish territory, including from Incirlik Air Base as well as from along Turkey's border with Syria. The expulsion of US diplomats and the closure of America's substantially large embassy, diplomatic, and military complex in Ankara would also be expected in the wake of an act of war on this scale. Additionally, Turkey would be expected to reevaluate its membership within NATO - an alliance that failed to come to Turkey's aid amid a military attack upon it by one of NATO's own members. One would wonder what the utility was of an alliance predicated on "collective defense" that is more likely to eliminate one of its own members, than a foreign enemy. Finally, considering Turkey's accusations against the United States, Ankara would be expected to realign itself geopolitically. This would mean closer ties to Europe, Russia, and Iran - among others. In order to do this, however, Turkey would have to end its role in the destruction of Syria which has resulted in a torrent of refugees flooding Europe, and in a conflict that has cost Russians and Iranians their lives as they fight to restore peace and stability across their ally Syria's territory. In all likelihood however, none of these changes will take place - indicating before the entire world that the coup was staged - not against Turkey - but in part by it, with the help of not only the United States, but also Gulen's political faction. It will represent a 21st century "Reichstag fire" leading to a 21st century "Hitlerian purge," removing the last remaining obstacles to President Erdogan and the corrosive institutions he has constructed in their collective bid to seize absolute power over Turkey. And quite to the contrary of those changes one would expect Turkey to make if truly the US engineered this coup to oust, not abet Erdogan, Turkey is very likely to double down on hostility toward neighboring Syria and its allies.